Tuesday Morning witnessed men and women beating chests and screaming in open. The roads were choked and it seemed that there are only two places to go; Zadibal and Qamarwari. The police and paramilitary forces were deployed in strength and soon the top rank officials were seen on roads. 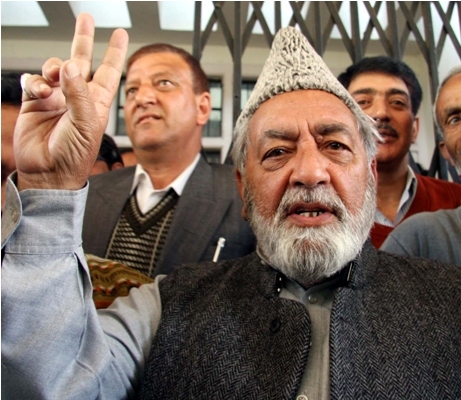 And the news spread like wildfire…firebrand Shia leader Molvi Iftikhar Hussain Ansari is no more. He was in mid seventies. Veteran political figure, versatile orator and outstanding religious scholar Molvi Iftikhar, according to family sources breathed his last at his Darul Jawad residence, Qamarwari Srinagar Tuesday night. The sources added that the news was made public in the morning. Having huge following in Shia dominated areas, Molvi Iftikhar was born on April 26, 1940. 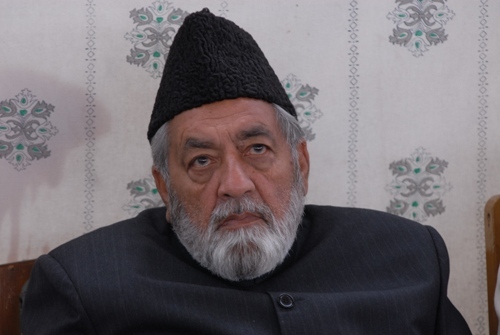 He studied Islamic theology in Iran, Egypt and Iraq and succeeded his father Molvi Muhammad Jawad as president of All Jammu and Kashmir Shia Association in 1962. Molvi Iftikhar entry into politics was seen as major shift. He was nominated as an MLC in 1973 on Congress ticket but switched to Janata Party in 1977. In Parliament elections, he first time contested against the National Conference during LS polls of 1977. And the NC’s candidate was wife of late Sheikh Mohammad Abdullah. Though he lost those elections but his contesting against NC was marked as the beginning of state’s mainstream politics. He switched back to Congress in 1980s and was chosen as leader of the Legislature party in the State Assembly from 1983 to 1987. He was again elected to the state legislative assembly in 1996 on a Congress ticket and became a minister in the National Conference (NC) government headed by Dr Farooq Abdullah. In 2002, Molvi Iftikhar joined NC and was elected from Pattan Assembly segment later that year but quit the party in 2006 to join the PDP. He lost the by—election. Coming back strongly in 2008, he was elected from Pattan Assembly segment. In forth coming assembly elections, he was PDP’s candidate from the same constituency. Currently a law maker from North Kashmir’s Pattan and Vice- President of State’s principal opposition Peoples Democratic party, Molvi Iftikhar was earlier member of Congress and National Conference. He served State as minister as well. Besides being well read cleric and mature politician, Molvi Ansari was also a business tycoon of state interests in car trade. His family also owns two leading showrooms in the summer capital of the state. Molvi Iftikhar is one of the rare political stalwarts who stood by the people of the state and did not leave valley during peak of militancy. He escaped three assassination attempts. In June 2000 Molvi Ansari escaped the explosion of a landmine while addressing a religious congregation at Gund Khwaja Qasim. The blast killed twelve people. In same year, on September 1, Molvi Ansari was injured by an IED explosion that killed two policemen and a driver. Not well from last few years, Molvi Ansari finally lost battle to chronic liver disease. In recent past according to family, he was in New Delhi for treatment. When flood hit valley, Molvi was shifted to his daughter’s residence at Alamgari Bazar. His condition deteriorated and was taken back to his Darul Jawad residence late Sunday evening. Amid sobs, wails and tears, Molvi Iftikhar’s body was taken for last rites. The people were in lakhs and the funeral procession passed through Saikidafar, Eid gah Hawal Gaysiyar Chowk and Alamgari Bazar. A lawmaker representing Pattan in North Kashmir was buried in Zadibal area in Srinagar. Cutting across political affiliations, his demise is being widely condoled. Known as the fire brand leader in the political spectrum of the state, Molvi Iftikhar’s demise is termed as the great loss for the state. Besides top leadership of PDP, Chief Minister Omar Abdullah was among the first to reach to the residence of Molvi Iftikhar and condole his demise, while Omar’s father Dr Farooq Abdullah termed the loss as ‘personal’.